Quinoa is the darling of health-conscious foodies because it’s a plant-based food with complete protein, and it feels so very light in the body. However, this same light quality can make quinoa hard to digest, especially for people with vata disorders. For that reason, I sampled the same dish using millet, which has a similar profile minus the amino acid lysine but can be easier to digest. Cooked millet reminds me of grits, both in taste and texture, and if you add another cup of water, it will be similar to polenta. 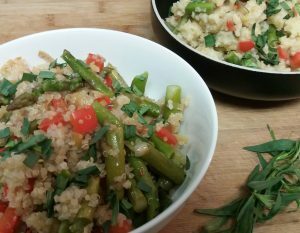 Enjoy this simple Asparagus Pilaf some time soon while the local asparagus are still filling spring markets! I typically use 3 cups of water to 1 cup of quinoa, which is more water than most recipes call for but easier to digest. If you prefer your quinoa light and fluffy, use 2 cups of water instead and cook it uncovered. If you have some fresh soup stock, it will be a nice addition but I prefer water to boxed stock. 1. Rinse the quinoa, strain it, and add it to a 2-quart saucepan with stock or water and 1/2 teaspoon salt. Bring to a boil, reduce the heat to medium-low, and cover the pot until all the liquid is absorbed, about 20 minutes. 2. While the quinoa is cooking, break and throw away the woody lower quarter or third of each asparagus spear, and break the remaining stalks into bite-sized pieces. Chop the bell pepper, and slice the leek. 3. Heat ghee or oil on medium heat in a large sauté pan. Add the sliced leek and sauté for about 5 minutes until it’s uniformly golden. Add the red pepper if using, cover the pan and cook another 5 minutes. 4. While the vegetables are cooking, chop the tarragon. Rinse and strain the asparagus so they are a little moist with water. Uncover the pan to add the asparagus. 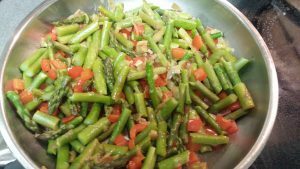 Stir once and recover for 7 to 10 minutes, until the asparagus are just tender. When all the vegetables are tender, stir in the quinoa (or combine vegetables with the quinoa in a large mixing bowl). Add fresh tarragon and a fine ground salt, to taste. Serve warm or at room temperature. Millet Variation: Use 1 cup millet with 2 1/4 cups of liquid for a texture that is similar to quinoa. Use 3 cups liquid for a texture like grits, which is easier to digest. Use 4 cups liquid to create a dish more like a polenta.